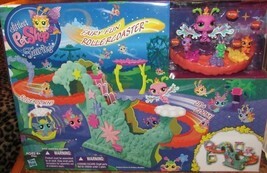 C P Treasures Imagine a magical world where fairies are real with this super-fun Littlest Pet Shop Fairies Fairy Fun Roller Coaster Playset! 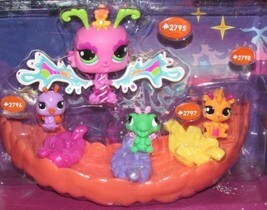 Your Soaring Skies Fairy Pet wants you to come along for a wild time with her three friends. They can't wait to zip and zoom all around these fun roller coaster games, and hop on the swing! They climb the stairs and then slide down in one of the three vehicles, and then do it all over again! With your fairy pet and friends, you'll have all the magical fun you can handle with this Littlest Pet Shop Play Set! 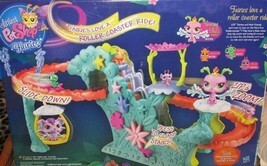 Littlest Pet Shop Fairies Fairy Fun Rollercoaster Playset: Playset includes LPS Fairies pet and friends for rollercoaster fun Put a pet or friend in 1 of the carts to slide down Put them in the hanging flower swing Gazebo and arbor make the playset even prettier Includes: 1 LPS Fairies pet: #2795 Soaring Skies Fairy Pet 3 friends: #2796 Bird, #2797 Turtle and #2798 Squirrel 3 vehicles Playset Accessories New in box For ages 4 Powered by Turbo Lister The free listing tool. List your items fast and easy and manage your active items.